LTHForum.com - Boston Fish Market of Des Plaines - Hallelujah fresh fish!! Boston Fish Market of Des Plaines - Hallelujah fresh fish!! 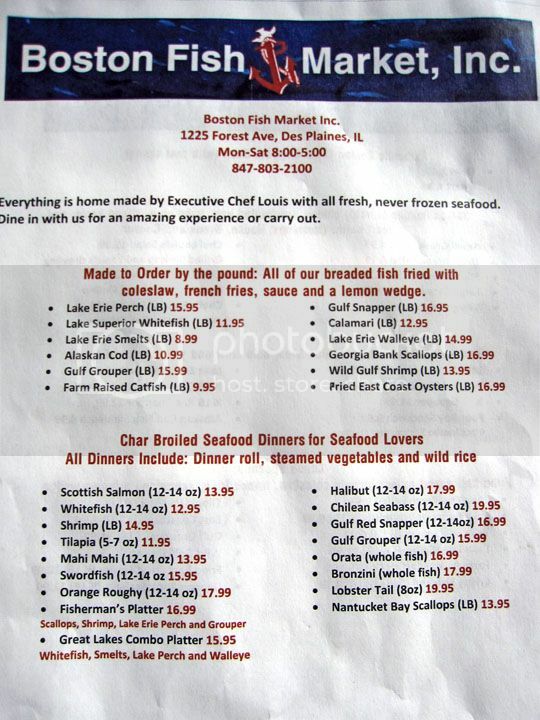 LTH Home > Chat > Eating Out in Chicagoland > Boston Fish Market of Des Plaines - Hallelujah fresh fish!! I'm giddy I tell ya, just giddy. Midwest processor of salmon & whitefish. fresh fried clams, if they do, I'll up my lunches to 3 times per week. purchases were small Manila clams sauteed/steamed in a mojo de ajo/white wine mix, just the clams, broth & some French bread, delicious. Pan seared halibut w/a cilantro/basil/shallot/lemon juice/olive oil "chimichurri" was gobbled up by my parents last night. Last edited by Sweet Willie on April 2nd, 2014, 10:05 am, edited 2 times in total. Thanks for the heads up. Do they have tables or is this a carry out option only? Interesting as this place has been in the back of my mind since I saw them loading a truck with fresh whitefish and lake trout on the shores of Lake Superior in this Bayfield write up. I didnt know they made food to order but have been telling folks looking for the freshest possible freshwater fish they might want to check them out. Thanks for the heads up. Dave148 wrote: Thanks for the heads up. Do they have tables or is this a carry out option only? They do have approx 12 tables & a few 2 person tall tables. Cooler with some canned pop/tea. I'm in trouble, I went today for lunch and they had fried clams, looks like I'll be going 3 times per week now. Fries are limp, decent flavor, but one doesn't go to a fish place for the fries. 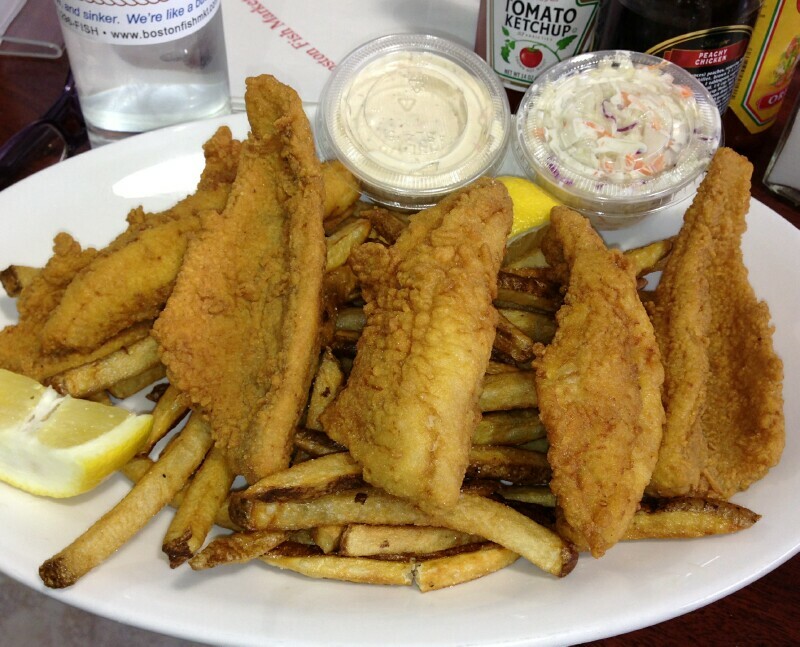 Edited to Add: Boston Fish Market does carry some smoked chubs of Lake Trout & Whitefish. Louis the owner said he has someone smoke it up north. I made a smoked fish dip out of one of the chubs for dinner on Sat night & had some flakes of smoked trout on my bagel this morning, delicious. Last edited by Sweet Willie on April 2nd, 2014, 10:06 am, edited 1 time in total. I was at Boston Fish for lunch today as well, must have just missed you. I had a walleye sandwich, a really terrific fresh fried walleye sandwich, and my lunch partner had the clams, which were perfectly fried with just a hint of clam funk, not quite belly clam funk, but enough to let you know they weren't the Sara Lee of the sea type so often passed off as fried clams. We seem to be on the same page as I took home a pound of smoked whitefish to make white fish salad. Moist, light smoke, not overly salty with delicious rich fish fat between fish flesh and skin, the kind we scraped off the cubs with a butter knife as kids and spread on bits of toasted bagel. Nice selection of fresh fish, lowest prices I can remember seeing in a while, and friendly, in an ever so slightly over the top fashion, pair of counter men straight out of Zorba the Greek central casting. Thanks for the post Willie, a little out of my geographic zone but I will be back soon. I went to Boston Fish Market with Gwiv yesterday and have to echo the positive comments about this place, hidden in plain sight on a side street in Des Plaines. I may just be projecting here, but my impression is that this is a big wholesale operation in which the owners, a couple of gregarious Greek guys, hang out in the small (relative to the size of the entire operation) retail space in the front schmoozing with customers and cooking. They have a small menu, but they will cook anything they have in stock in pretty much any way you want. And when I say "in stock", they have quite the variety of species on offer, from Lake Erie smelts, to Gulf-sourced Red Grouper ("We don't sell black grouper because the heads are huge and there's too much waste."). This place has the selection of Issacson & Stern and the quality of Dirks, at a price point approximately 30% less than Dirks. For example, they were selling big beautiful #14 Gulf of Mexico shrimp for $9.00/lb. I ordered clams and was very happy with my choice. These were freshly breded and expertly fried. The clams themselves were large and very plump. As much as I love the belly clams at New England Seafood, these were equally as good if not even better, despite just being clam strips without the bellies. If I had anything negative to say, it would be that the fries just aren't very good They are fresh cut and single fried to a not quite done flabbiness. I didn't eat them, but there were enough clams in my order that I didn't need to. It's a small gripe and one that won't affect my desire to return for more fish. Next time, I'm getting a grouper sandwich. Gwiv ordered this beauty of a sandwich. Take that, Culver's. I'm not sure how long Boston Fish Market has been around. It certainly wasn't there back in the day when my office was in the area, but I'm glad it's there now. 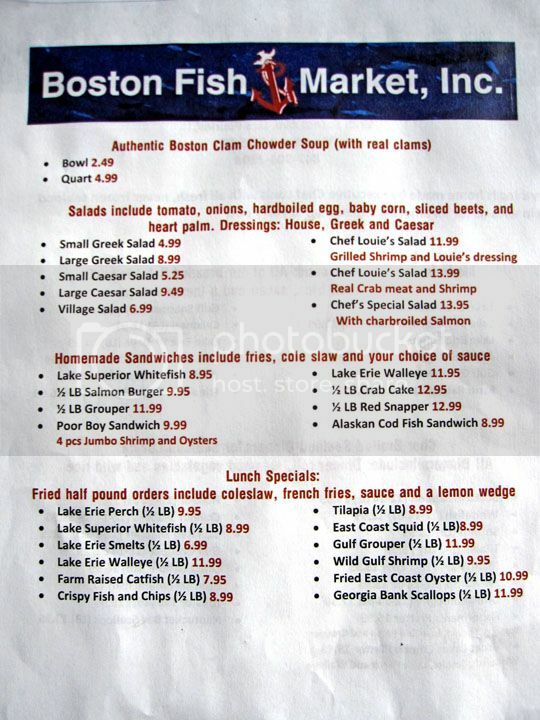 Aside from being a great lunch option, Boston Fish Market is going into my rotation as a source of raw fish and seafood. From were I live, it takes about the same amount of time to get there as it does to get to Dirk's, and I'll be making that trip often. stevez wrote: I'm not sure how long Boston Fish Market has been around. It certainly wasn't there back in the day when my office was in the area, but I'm glad it's there now. They used to be over on a side street by the Ace Hardware on Oakton but way in the rear of this side street in a small strip mall. I've lived in DP for 15+ years & never knew about the original store (but in fairness I understand they had one 4' fridge unit for retail, their business was almost all wholesale, so I guess that is why I never heard anything about them). Sorry I missed you and Gary yesterday, let me know if you are coming out for lunch sometime. G Wiv wrote: .... and friendly, in an ever so slightly over the top fashion, pair of counter men straight out of Zorba the Greek central casting. I've eaten from here 5 times in the past 2 weeks myself and echo the excellence of what has already been posted. Be warned...it can be a wait with items being freshly prepared. My wife has already lobbied them strongly for an extension of the 5:00 closing time and taken some jeering about their already brutal hours. Add the clam chowder (sludgy-leaden, too much butter and no hint of any pork salt) to the fries as the below par offerings. The home prepared #14-$9/lb shrimp cooked up/tasted great too. They do seem committed to this new food prep/retail part to their wholesale operations but...may have some serious growing pains on food prep with expected increasing popularity. Yes, but can you get Fish McBites there? If you lived in Park Ridge, oh let's say, near Talcott and Courtland at that annoying intersection, would it be close enough to head over for lunch, or would it be best to go there for fresh fish that you take home and cook yourself? I haven't found a source I really care for to purchase seafood close by, so this could be the ticket! Oh, another question -- I bought something at Don's Dock in Des Plaines a while back, and was happy with whatever it was (can't remember now -- maybe crab meat?). What would be the difference between the two places? While I'm sure the lunch is great, I'm mostly interested in the fish market so thanks for the info. Will plan a trip there soon. sdbond wrote: If you lived in Park Ridge, oh let's say, near Talcott and Courtland at that annoying intersection, would it be close enough to head over for lunch, or would it be best to go there for fresh fish that you take home and cook yourself? I haven't found a source I really care for to purchase seafood close by, so this could be the ticket! from Talcott & Courtland, I'd say ~15min drive, 20 tops if bad traffic. while I'm loving the lunches I've had at BFM, the real reason I'm giddy is the fact that there is now a quality fish monger in the Des Plaines area as I too have never cared for the local markets seafood offerings. Being so close to my home, I've gone to Don's Dock to get my fix of fried clams or other item. Every time I'm done I question why I went again. 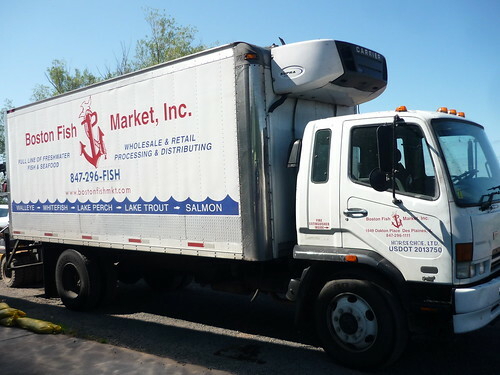 Don's Dock just isn't close to the quality of food prepared and there is no way that Don's Dock has the volume of BFM to compete with the quality/freshness of seafood being offered to take home and prepare, let alone the more choices of items that BFM offers. Thanks, Willie; this place sounds like a winner. I will have to make it a point to stop by soon. So I went here for lunch today and all I can say is WOW...friggin' amazeballs! Not realizing that it was Lent being a non-Catholic I quickly realized it upon arrival and seeing it packed to the gills (pun intended) on a dreary Friday. I ordered a 1/2 lb fried whitefish and a 1/2 pound sauteed red snapper. The whitefish came with fries and slaw which as posted above were just okay but the fish nearly made me weep with it's just right crispy coating and delicate perfectly cooked interior. The tartar sauce was just perfect and a slight shake of salt and squeeze of lemon made the fish sing. The snapper was cooked perfectly and was simple and clean in preparation accompanied by steamed rice and broccoli/carrots. The fish in Louis' case would make Dirk blush with envy in terms of freshness and price and IMO if this place was in the city there would be a 2 hour wait to eat this stuff. Louis told me on an earlier recon mission this week where I didn't eat but just picked up some impeccably fresh dourade that he wholesales to the wholesalers. This let's me know he's at the top of the food chain in terms of quality and price. Go now before this place inevitably ends up on everybody's radar and you are waiting 2 hours for the best of the best in terms of fish in this city. chefmcone76 wrote: all I can say is WOW...friggin' amazeballs! What kind of batter are they using on their Fish and Chips and the walleye sandwich, i.e. beer batter, dry batter, or something else? Those clams look awesome. I picked up some pristinely fresh grouper from Boston Fish Market on Saturday and grilled it last night. I'm glad to have found a reliable source for grouper in the Chicago area, a fish that's not readily available in these parts. stevez wrote: I picked up some pristinely fresh grouper from Boston Fish Market on Saturday and grilled it last night. I'm glad to have found a reliable source for grouper in the Chicago area, a fish that's not readily available in these parts. A little taste of PJ's on St. Pete Beach, Steve? Right you are. Can't remember the last time I've been confident in buying grouper around here. It is absolutely all over the seafood joints in the Tampa/St. Pete/Sarasota area on the west coast of Florida, and it's so fresh down there it's almost impossible to screw up. Fantastic lunch yesterday at Boston Fish Market. Got the 1/2# scallops lunch and when asked if I wanted them fried or grilled I opted for both. I got 4 huge, delicious scallops (2 fried, 2 grilled) and they were all fantastic. The fried ones were a little soggy (probably due to the butter and juices from the grilled ones seeping over) but still better than most executions I've had. Both of them had the texture of butter; perfect. Picked up some smoked trout and smoked salmon to have for dinner later and $3 worth of each (~1/3#) easily fed 2 of us for dinner, no problem. You really can't beat these prices; I actually plan to pick up a bunch of the salmon (and maybe whitefish) for a Sedar. Definitely glad to have this place so close to my office. I see many more returns in my future. Had a fantastic lunch two Saturdays ago at Boston Fish Market. Started with 1# of cooked jumbo cocktail shrimp served on a bed of ice with a tangy cocktail sauce and a chunk of lemon. Plump, sweet and delicious. I ordered a Walleye sandwich while FlavorFool ordered 1# of deep fried oysters - well, she was going for 1/2# but I nudged up her order . Both were outstanding. The oysters had a light, crispy coating and a warm, creamy interior - very fresh and oceany. You can see a photo of the sandwich up post. I'm a sucker for a good fish sandwich, and this was a great one. When we were getting quite full, rather than leave 1/2 a sandwich uneaten, I pulled the double fillets out of the lightly grilled bun and ate them on their own. So glad I did, as the full flavor of the Walleye was more evident on it's own. Deep fried, light crunchy coating, and cooked perfectly - these people know how to cook fish - and not over cook. We both enjoyed the heaping pile of skin-on fries that came on each of our plates. A little soft, rather than crunchy. Great flavor, and perhaps an acquired taste style wise. Took home 1# of cod, and a night later sautéed it in olive oil/butter and made a pan sauce of shallot, capers, white wine, lemon and parsley. Cooked until just flaky, it was cod heaven. Following night we sautéed lightly breaded crab cakes until the centers were warm and they were lightly browned. Some of the best I've had away from the East coast. We had some cocktail shrimp and oysters left over, and Michelle was happy to bring us some 'take home' boxes. Dino, Louie's brother, was bringing out customers' orders on heaped plates and baskets and working the extensive retail fresh seafood counter (much more than just fish). Mike was taking orders and working the cash register. Mike normally runs the wholesale side but was pulled from his computer Saturday to help speed service to the crowd in the cafe. A very friendly and helpful crew! Below are photos of the rumpled front and back menu from that Saturday, including address, phone and business days/hours (note they close all days at 5pm!). I'm going to try to head back either today or Saturday for some clam chowder or fried clams and some grouper for the grill. Thanks, SweetWilly, for bringing this place to our attention. After my first visit you might say I'm 'hooked' . Last edited by DRC1379 on March 16th, 2013, 2:41 pm, edited 1 time in total. DRC1379 wrote: We both enjoyed the heaping pile of skin-on fries that came on each of our plates. A little soft, rather than crunchy. Great flavor, and perhaps an acquired taste style wise. I forgot to mention in my post above that on my most recent visit the fries were spades better than my first. The first time they were pretty much inedible but now they were perfectly fine. Certainly not great (maybe not even good) but I did eat all of them the last time (which I guess may not be saying much). Given the variety and prices I can't say I buy the "all fresh, never frozen" claims. I was going to say it seems very plausible to me, given the wholesale nature of the place and the emphasis on lake fish (which is why I find this place very appealing). But looking at some of the European whole fish, I guess healthy skepticism could be warranted. Then again, Meditreranean fish, particularly farmed varieties, fresh never frozen, do show up plenty on menus from fancy Italian places down to Greektown, so why not. They have to come from somewhere. I just got back from there. It's great to have another source for good fried shrimp -- about forty minutes closer than GNR Captain Porky's, and definitely better than Don's Dock. Both Don's and Porky's are more of a crunchy breading -- this tasted more like a batter, but thin and crisp. Don's uses smaller shrimp, and has never thrilled me in terms of flavor. Porky's is just as big, perhaps tastier shrimp, but I'd have to do a side-by-side (nearly impossible given the travel distance to do it justice). I'd still give Porky's an edge on accompaniments, given that they don't do barbecue, fried cheese, eggplant, mushrooms, or whatever Dino happens to have found to crisp up in any given week. (I have to give Don's a small nod for having hush puppies, but they're not best-of-breed). While the fresh-cut fries at BFM were brown and tasty, they were rather greasy and limp. I'm guessing the oil is too hot, they're not cooking enough before they brown up (they need a blanch at lower temp first, would be my prognosis). Still, having two new fresh-cut-fry places in Des Plaines in the last year (along with Rand Red Hots) is a good thing -- can't stand McD's style shoestrings. On the Did I Miss My Smelt Window ? Boston Fish Market's smelt are given high praise, and rightfully so. As good as the smelt, and pretty much everything I've had at BFM, are its the lake perch that I've been thinking about for over a week. 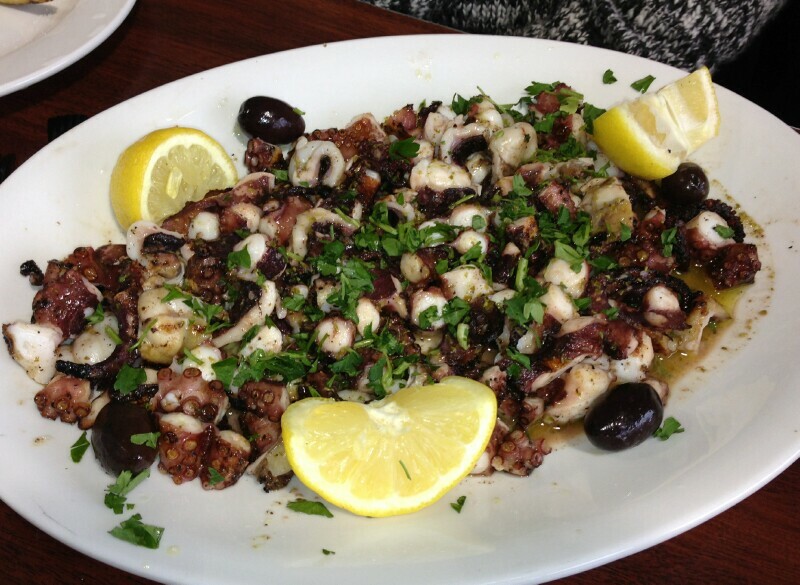 Grilled octopus and fresh grouper were terrific, but oh those lake perch. The perch was as perfect as it can be. The octopulpo and smelts were excellent as well, but it's the perch that was the single best bite of the day for me. Right you are on the lake perch, Gary. While we were buying some tilapia, grouper, scallops & shrimp for the evening's repast one day last week, my nephew and I decided to split a lake perch platter to eat in. Oh my. Piping hot, crunchy yet soft, doused with a few drops of malt vinegar and a little tartar with a hint of garlic, I can't imagine the old Phil Smidt's being any better. Serviceable skin-on fries too. Yellow perch has been the biggest local seafood revelation for this former East Coast/Florida transplant. Not sure there's a fish that fires up better. I'll need to get a map out and find Des Plaines. How was the charbroiled calamari? Is it a dinner or special? I am such a fan of Greek Islands' version-does this rank up there?